If you have Netflix, then you may have tuned in to the new show Tidying Up. It’s based on the best-selling book The Life Changing Magic of Tidying Up, written by Marie Kondo. In the show, Marie Kondo demonstrates her simple yet thorough way to declutter and organize your home. 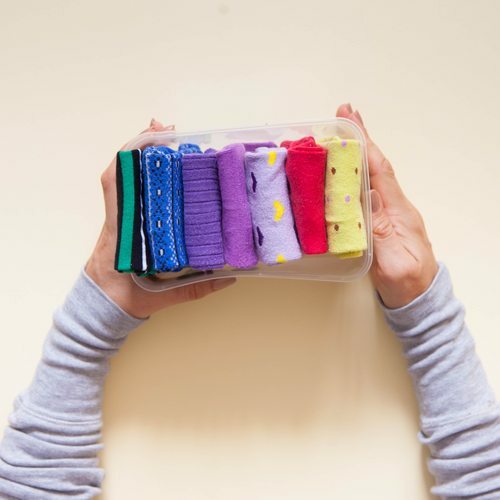 If you’re a homeowner who is ready to sell, or you’ve just moved into a new home and you want to get a fresh start, the KonMari Method may work well for you. Here’s an introduction to how the process works. How can you create a plan for your life if you don’t know where you want to go or what you want to do? The very first step in Marie Kondo’s system is taking time to visualize the life you want to live in your space. Imagine your rooms being clutter-free and all your cabinets and drawers being neatly organized. Imagine how much less stressed you’ll feel when you know where everything is. Think about the kinds of activities you’d like to do in your home, such as hosting more parties or creating a space for your hobbies. Doesn’t it feel good to live in this imaginary space? The KonMari Method was created to help you attain that feeling. The key element of the KonMari Method is only keeping items that spark joy for you. How do you determine which of your belongings make you feel this way? You hold each of them in your hands. Yes – every single item you own. When you hold the object in your hands, you ask yourself – does this item bring me joy? If the answer is yes, you keep it. If the answer is no, you discard it. Remember – this is about how you feel, not about how anyone else feels. Even if it feels irrational to keep an old t-shirt that no longer fits, if it sparks joy, you should hold onto it. When you have determined that an item no longer sparks joy, before discarding it Marie Kondo advises that you thank it. This is an important concept that can radically change how you view the objects you own. When you recognize that your belongings have their own energy and you begin to honor that energy, you will treat your things with more respect. Carrying that idea forward, when you organize the things that you are going to keep, you store them in a way that is easy to see and gives each item some space. Once you’re ready to dive into the process, Kondo recommends tackling your belongings by category. She suggests starting with clothing because it is the easiest category. You then move on to books, followed by papers. The next category is called komono, which includes all your miscellaneous items that you’ll find in the kitchen, bathroom, and garage, for example. Finally, you end with sentimental items. The idea is that you will begin to get a feel for what sparks joy and start to trust your intuition with the early categories. That way, when you get to sentimental items, which can be very emotional, you will be able to tell what you should keep and what you can let go of. Do you love reading my helpful articles? Now you can have them delivered to your inbox! Just tell me where!